Well we have quite the doozy on our hands folks. All the events that have been building and building in Avengers, and New Avengers, are starting to come to a head. Finally. Way, way back in the early issues of the reboot of this Avengers line, this was written: “The idea begun by two men. One who was life. And one who was death.” Ominous, but we now get some insight into what that means. Jonathan Hickman is a literal crazy person when it comes to writing comics. I have no idea how he churns out so many books each month, both for Marvel and Image. Also, every book he does is of a certain quality as well, and at least to my knowledge one doesn’t fall flat. The art in this book is done well by Jim Cheung, Paco Maedina, Nick Bradshaw and Dustin Weaver. Those are just the pencil artists. This book has a plethora of artists on it, and it shows for better and worse. This book can be quite confusing to the casual reader, and there just is too much info to catch you up on. 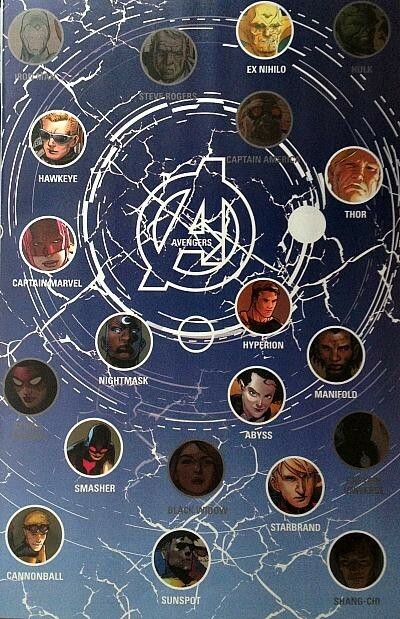 Basically, the world that the Avengers live on is one of infinite parallel worlds out there. Something happened that started a cataclysmic chain of events, with worlds crashing into each other and obliterating earths across the multiverse. See, told you it was a tad confusing. 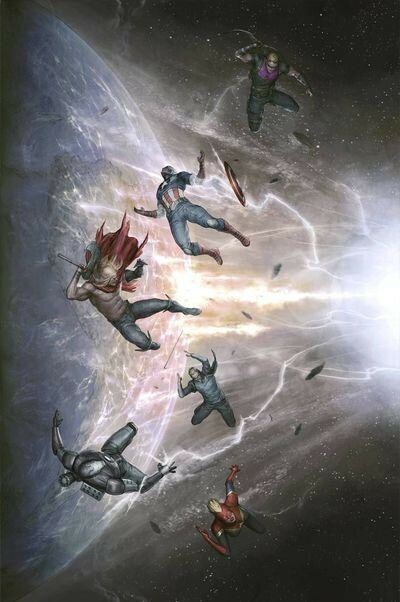 But the Avengers that we know and love from our universe stepped up to try and stop these incursions. But the Illuminati, the cabal of some of the smartest heroes in the universe, had other, secret plans as well to try and take care of business. Now, we are left with heroes from all corners trying their hands at helping, as well as sometimes coming into contact with heroes from other earths. Throw in newcomers like Ex Nihlo and Abyss, as well as new avengers like Nightmask and Manifold, you get quite the convoluted stew. Normal cover reveals the craziness! As simple as I can put it, this book gives us two specific things as readers of Avengers. One, we get a glimpse of what is to come, most likely after the upcoming AXIS event that will be starting up real soon in the Marvel Universe. We see Thor with a beard, missing an arm and wielding an axe. We see Cannonball living on another world with a wife? and child, and also Sunspot has bought A.I.M. We also see Avengers tower, now SHIELD HQ, and some new players who happen to be SHEILD agents now. Two, we get a clear look at what could possibly be happening to the Avengers, and the Fantastic Four in this issue. No spoilers, but some people are visibly absent from the picture, which leads to many more questions. Hickman does a fine job of storytelling here, but if you haven’t caught up on recent Avengers titles, it can be tricky to navigate. Seeing characters like Cannonball and Sunspot get more panel time is always a plus, and also checking in on what SHIELD is up to in the near future is interesting. 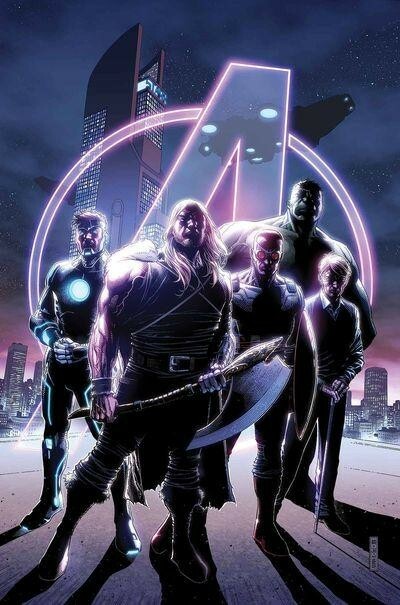 As much as I am invested in this story ( I collect Avengers, New Avengers, Uncanny Avengers and Avengers World) I am having a tough time keeping up with what is going on. That is coming from someone who is collecting four major Avengers titles as well as specific character books, some of which touch on these events as well. I am very curious to see where this will all go, but it feels more and more that this story will only make sense when it is in the rearview, and we can buy a trade and read it over a few times. CBH Score: 3 out of 5. It’s a good title still, but it is getting really hard to go along with and understand all of what is happening. Especially with time jumps and such.